The Dutch National Police force has revealed that it would be training eagles in bringing down unmanned drones in emergency cases. The purpose is to disable a drone which may for instance, tend to wander in the airspace of a city centre or an airport or without the danger of falling from the sky and on anyone below. Development of anti-drone UAV are also taking place though it presently seems to be simpler and cheaper in the use of nature’s greatest hunters instead of one of humanity’s lest dependable robots to do the task. It is reported that the Dutch police will be working with a company known as `Guard From Above’, or a translation of that name for training of the eagles, a firm in The Hague who tend to specialize in training birds of prey for private security, in helping to protect the skies from rogue drones. With the training, the eagle tends to recognise the drones as prey which they disable with the claws. Thereafter the eagle deposits the drone in a space which is distanced from civilians. A specific example, which was posted to YouTube, the eagle picks out a DJI model and does it quite effectively. So far, the project seems to be under trail with the police assessing if they want a full fleet of drone busting birds of prey. The police have also been working on other systems to take the drone out from the sky including hacking the drone as well as just using a net or the combination of both. However, the potential of the eagle tends to provide more flexibility once the machine is recovered. Eagles in the wild have portrayed a natural inclination in attacking drones on sight as hawks, rams and chimps and thus it may not be the most awful idea if the safety of the animal can be assured. Drones are getting cheaper and much more accessible, increasing the apprehension that they could be utilised by criminals or terrorist groups. Taking this into consideration, recently the Japanese police force has announced that they would organise a battalion of anti-drone officers and disable drones. The Netherland’s Police had mentioned in a statement that `in future, drones would be used progressively and hence it would increase the number of incidents regarding drones and could also be utilised for criminal purposes. The security firm state that the technique used is not harmful to the birds and is not dangerous than the scraps they get into with prey in the wild. Their feet are heavily scaled to precisely protect them from sharp bites, scratches and slashes. 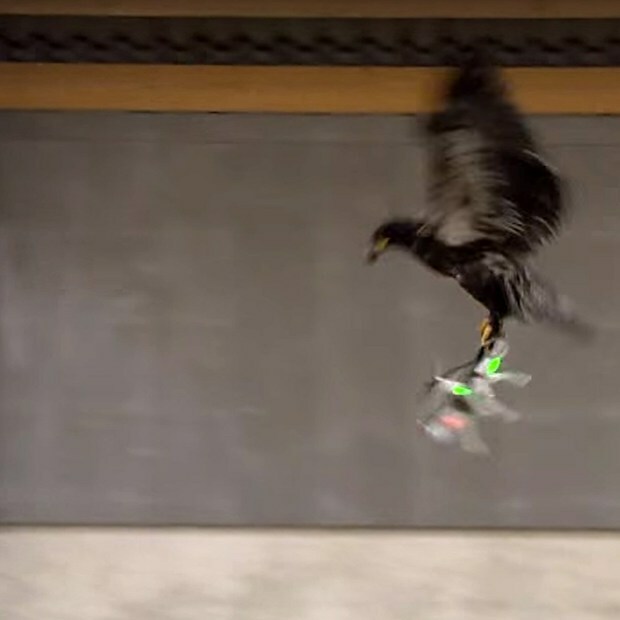 Nonetheless, the company has been working with the Dutch Organization for Applied Scientific Research to evaluate whether the propellers of the drone tend to affect the claws of the bird. `Guards from Above’ had mentioned in a press release that they used birds’ natural hunting instincts to intercept drones and this was done safely, accurately and quickly. The animal instinct of a bird of prey is exceptional and capable of overpowering fast-moving prey. At times the solution to a hypermodern problem is more obvious than one might imagine.